Belted Galloway cattle lovers will have a unique opportunity to buy into some of the country’s finest bloodlines at the Whitepool Dispersal sale at Worcester on Saturday 26 May. Breeder Jane Smith has produced some of the best Belted Galloways in the country since she founded the Whitepool Herd in 1998: Northern Light, Whitepool Neptune, Whitepool Moondust and others. She has now decided to sell her herd of championship cattle to concentrate on endurance riding. Jane says: “Quite a few people have dispersal sales because they may not be in the best of health – mine is for the opposite reason!! 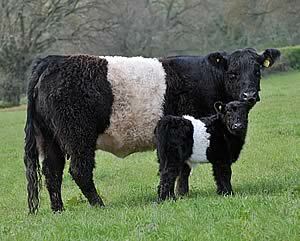 I have owned Belted Galloway cattle since 1998 and have thoroughly enjoyed them. “We have enjoyed great success with wins at all the major shows, culminating in interbreed titles on several occasions and many high priced sales. However, a couple of years ago I took up horse riding again after some 30 years away from it and I started to compete in endurance rides and became seriously hooked. The cattle achieved the Interbreed championship at the Bath & West Show 2011, Res. Supreme at the Royal Highland and Supreme Champion at the Great Yorkshire. The same year brought top prices at the Castle Douglas sale, where she also won the sale’s National Show Herd competition and Stockman of the Year. Jane Smith says the cattle are all easily handled, with good temperaments and are in the Biobest Herd Health Scheme and are Lepto, BVD, Johnes and IVR tested clear. Only the best male calves have been kept as bulls and only the best genetics have been purchased as stock bulls. Jane is also responsible for organising Europe’s biggest ram sale at the Royal Welsh Showground each September.